“The enthalpy of fusion is the change in enthalpy resulting from heating one mole of a substance to change its state from a solid to a liquid. The temperature at which this occurs is the melting point. The enthalpy of fusion is a latent heat, because during melting the introduction of heat cannot be observed as a temperature change, as the temperature remains constant during the process. The latent heat of fusion is the enthalpy change of any amount of substance when it melts. When the heat of fusion is referenced to a unit of mass, it is usually called the specific heat of fusion, while the molar heat of fusion refers to the enthalpy change per amount of substance in moles. The liquid phase has a higher internal energy than the solid phase. This means energy must be supplied to a solid in order to melt it and energy is released from a liquid when it freezes, because the molecules in the liquid experience weaker intermolecular forces and have a larger potential energy. When liquid water is cooled, its temperature falls steadily until it drops just below the freezing point at 0 °C. The temperature then remains constant at the freezing point while the water crystallizes. Once the water is completely frozen, its temperature continues to fall. To heat one kilogram (about 1 litre) of water from 283.15 K to 303.15 K (10 °C to 30 °C) requires 83.6 kJ. Wikipedia on Enthalpy of fusion. Ok, so we need to know the temperature of the ice in Greenland in order to calculate how much energy it takes to melt it. Most likely it’s not all one temperature. It must vary. We can simplify for starters assuming the ice is 0c. 2,580,000 cubic kilograms of ice is a mass of 2.85×10^18 kilograms (wolframalpha.com/input/?i=2850000+cubic+kilometers+ice+in+kilograms.). Using equation (1) above we find that 333.55 kJ for 1 kg of ice to melt and we have 2.85×10^18 kg of the darn stuff which means that to melt it we need to input 333.55 kJ * 2.85×10^18 kg which is 9.51×10^20 kg kJ (kilogram kilojoules). That’s a lot of energy required. 9.506×10^20 kg kJ to melt all the ice in Greenland. For those challenged by scientific notion, that is 950,600,000,000,000,000,000 kJ to melt the 2,580,000 cubic kilograms of ice. 5) ~37 x 2003 estimated energy in world’s coal reserves. Ok, that is a huge amount of energy. Could we intentionally melt all the ice in Greenland if we wanted to? How could we melt enough ice for a 20ft rise in sea levels. So all the nukes every detonated generated ~2.1×10^15 kJ of energy and it would take 9.506×10^20 kJ to melt Greenland. Wow, we couldn’t do it with all the nukes ever detonated!!! We’d need 452,677 (4.527×10^7) times as many nukes!!! That’s a SIX ORDERS of MAGNITUDE larger amount of energy required! We don’t even have enough nukes to do the job. Does Mother Nature have enough energy in the Earth System to melt that much ice? Over what time period? Note that the volume of ice in Greenland would drop the temperature of four times the volume of water at 20c to 0c with this melting. What effect would that have? Is there any physics that would have the ice melt faster? How much more energy is required? What if it’s flowing water over the ice? Does that make it melt faster? It would still need the same amount of energy would it not? Ice causes the air temperature to be cooler thus limiting the rate of melting further. About the only way that we could melt all the ice in Greenland is to maneuver an asteroid the size of the Chicxulub and get it to drop on Greenland. Baring unpleasant side effects of doing that it would get the job done quickly. No doubt about that. So how can Mother Nature do this? Where does the Earth Climate System have a spare 9.506×10^20 kJ kicking around? The Climate Scientists claim that it could do that in 100 years? Really? There’s really 9.506×10^18 kJ of extra energy kicking around in the Earth’s Climate System each year for a 100 years to do that? Really? Please oh where are you energy? So if the Earth’s atmosphere did warm up and Greenland started melting like crazy, four times the volume of water that melted would drop from 20c to 0c in the process and that would alter the temperature of the oceans on a global scale which would cool the planet and stop or dramatically shift the atmospheric temperatures likely enough to stop the warming. So maybe this is part of the climate negative feed back system? All this from a desire to do a back of the envelop calculation. Damn us system scientists and engineers, always with our back of the envelop calculations. Originally posted as a comment here: wattsupwiththat.com/2012/03/12/gosh-really/#comment-920967. This entry was posted on March 12, 2012 at 1:20 pm	and is filed under Climate Science, Debunking Bad Environmentalism, Doomsday Claim Falsified, Ethics in Science, Exercise For the Reader, Get some perspective people, Good science attitude, Hard Science, Hard Science Required, Humbled by Nature, Rational Thinking, Reality Based Environmentalism, Terraforming Earth, TerrorForming Earth, The End is Nigh, The Ground is Falling Up!, Vaporizing Earth!. You can follow any responses to this entry through the RSS 2.0 feed. You can leave a response, or trackback from your own site. How dare you introduce logic and mathematics into this debate. You are a bad person … but I like you. How can these modellers – reviewers get it so wrong? Surely someone amongst the we’re all going to die camp have studied chemistry / physics / etc were the latent heat of fusion of ice is taught at high school and up. Maybe the curriculum has changed since I was in highschool in the 70s. Excellent questions that need to be answered. How can these modellers – reviewers get it so wrong? Easy ! They can’t even get a correct interpretation out of their own model energy balance. They say at the top of atmosphere there is a “balance” of energy such that incoming solar energy = outgoing longwave IR. Effective temperature ( sigma x T^4) X area of sphere ( 4 x pi x R^2). What this really says in a nutshell is that for balance when the energy is illuminating a disk shape the whole sphere only needs to radiate a quarter of the incoming energy to achieve balance – see the 4 x factor is on the outgoing side. Then they confuse themselves, the poor dears, by assuming the solar energy is one quarter of the solar constant. But this is backwards – the outgoing longwave IR is numerically one quarter of the incoming solar radiation not the way they claim. They seem to be too dumb to see their original formulation of an energy balance DEMANDS the solar radiation is 4 times the outgoing longwave IR. Yet in every “calculation” these people make the first thing they do is reduce the solar radiation by 4 then tell us how clever they are. I see no justification for using one quarter of the solar radiation in any calculations other than to demonstrate that because of geometry a sphere radiates one quarter of the numerical strength of the illuminating radiation – there is no way anyone who thinks about can justify the one quarter insolation theory. And don’t tell me it is an average without explaining how the solar radiation knows how to spread all around the globe and sneak in under the cover of darkness. pwl, you have done your best to scare people with the big numbers (your “cubic kilograms” are pretty scary to but I assume this is a typo and you meant cubic kilometres). Let’s tame the numbers a bit. First, lets talk about energy in units of exajoules, EJ to its friends. An exajoule is 1×10^18 joules. Your 9.506×10^20 kJ to melt all of the ice on Greenland is pretty close to 1×10^21 kJ, so lets use that. 1×10^21 kJ is 1×10^24 joules and that is 1 million EJ. That is a lot of energy. Simple division tells us that over 100 years and average of 10,000 EJ per year would be required to melt this ice in a time frame of 100 years (10,000 x 100 = 1,000,000).. So how much energy is available in good old sunshine? Wikipedia tells us: “The total solar energy absorbed by Earth’s atmosphere, oceans and land masses is approximately 3,850,000 exajoules (EJ) per year.” ( http://en.wikipedia.org/wiki/Solar_energy ). 10,000/3,850,000 = 0.0026. Expressed as a percentage, this is 0.2% of the total energy absorbed by the earth on an annual basis. Suddenly that 10,000 EJ per year requirement looks pretty small. Consider this, the surface area of the earth is 510 million square kilometres ( http://en.wikipedia.org/wiki/Earth ). The area of the Greenland ice sheet is 1.71 million square kilometers ( http://en.wikipedia.org/wiki/Greenland_ice_sheet#The_melting_ice_sheet ). So the ice sheet is 1.71/510 = 0.003353 or, 0.3 % of the total earth’s surface. If Greenland was to receive it’s fair share of solar energy, it would receive 3,850,000 EJ/yr x 0.003353 = 12,909 EJ/yr. Ah shucks,that’s more than the 10,000 EJ/yr required to melt the ice sheet! – Greenland is quite far north so it probably receives less than the average solary energy, just how much less I don’t know. But, my basic point it that the amount of energy available on the “average” chunk of the earth’s surface is already in excess of the required 10,000 EJ per year needed to melt that ice in 100 years. Something to think about… if the albedo of the surface of all that ice decreases, the amount of energy adsorbed from sunlight will dramatically increase. Consider all the dust that will be generated by the up coming iron mine on Baffin island ( http://www.cbc.ca/news/canada/north/story/2012/09/15/north-baffinland-mine-decision.html ). That dust and westerly winds may just do a lot to dramatically increase solar energy uptake of the the icesheet and move things along quite nicely. Regarding atom bombs, they are puny. Impressive looking yes, because if you release all that energy in a millisecond is the space of an outhouse, you get a very impressive firecracker. But it drizzles out to next to nothing when you smear it across 1.71 million square kilometres. 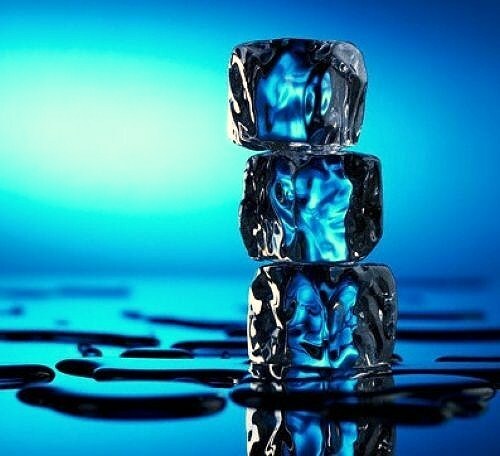 It takes 3.34 * 10^17 joules to melt 1 cu Km of ice. So it would take 10^24 joules to melt the Greenland ice cap. This is about 3 months total energy from the sun or 0.25% of the total energy over the century. The decline in the arctic sea ice cap will lower the albedo of the earth sufficiently to add this amount of energy into the global system. On top of this the increase in temperature as a result of AGW will add far more energy into the system. There is no doubt that the required energy will be abundantly available over the next century, the question is where it will have an impact. Well DavidR and Rde you’re both making a mistake assuming that all the sun Sol’s energy would be directed at Greenland, it isn’t and couldn’t be. One must deal with actual objective reality and not fantasy computations. To be correct one must take the amount of solar energy covering Greenland throughout the year (Rde partly did this); however that isn’t enough as you also realize that Greenland is a cold place almost always below freezing precluding it from melting even in the summer, the sun hasn’t melted it in a very long time proving your hypothesis incorrect. For example, “The ice in the current ice sheet is as old as 110,000 years.” – http://en.wikipedia.org/wiki/Greenland_ice_sheet#cite_note-MeeseOthers1997a-4. Also during the last 12,500 years the Greenland climate has been up to 2-3 C warmer than any temperatures in the last 100 years it’s not likely that even the over estimated predictions of “doomsday warming” would impact it in the slightest in 100 years or even much in thousands of years. So who’s calculations are correct? The right thing to do is to admit a mistake. On the intuitive one seems low and the other high. I am sorry to be lazy but I’d probably need a week to master all the variables and check it myself especially with Rosco’s claim the NASA model is wrong. What if we pulled a black sheet over Greenland? This should certainly make it a quite nice and warm place in the summer. It would only require the average person on Earth to buy roughly 250 square meters of black sheet. Fully doable. Why that is interesting to me is I computed that number while doing this thought experiment on how much damage earth would sustain if such a spacecraft strike earth. I was then looking for if that is enough to melt earth crust and we’ll found that it is enough to melt Greenland ice!